Calpine Energy Solutions, LLC., is a subsidiary of Calpine Corporation, a Fortune 500 company and America's largest generator of electricity from natural gas and geothermal resources. Calpine's clean, efficient, modern and flexible fleet uses advanced technologies to generate power in a low-carbon and environmentally responsible manner. Please visit www.calpine.com to learn more about why Calpine is a generation ahead - today. As one of the top retail energy marketers in the country, Calpine Solutions supplies natural gas, power and associated energy and risk management services to our customers throughout the United States. 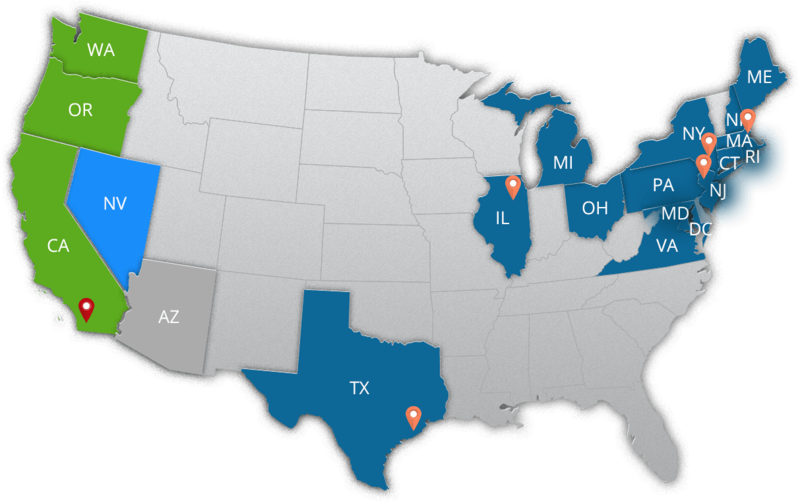 We are a licensed retail energy provider in every deregulated state in the US, including California, Oregon, Arizona and Virginia. We tailor our products and services to capture the benefits of customer choice while protecting our customers from unexpected increases in energy prices. Our cutting edge risk management programs are flexible and designed to meet the unique needs of our customers while providing a wide range of solutions to help meet or beat their budget goals for energy expenses. Click here for our latest regulatory update. Click on a state for specific environmental disclosures or additional regulatory information.